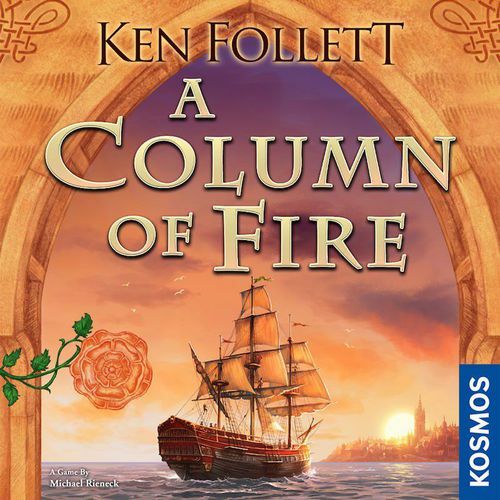 Column of Fire is the third game in the series of book adaptations of the Ken Follett Kingsbridge series. 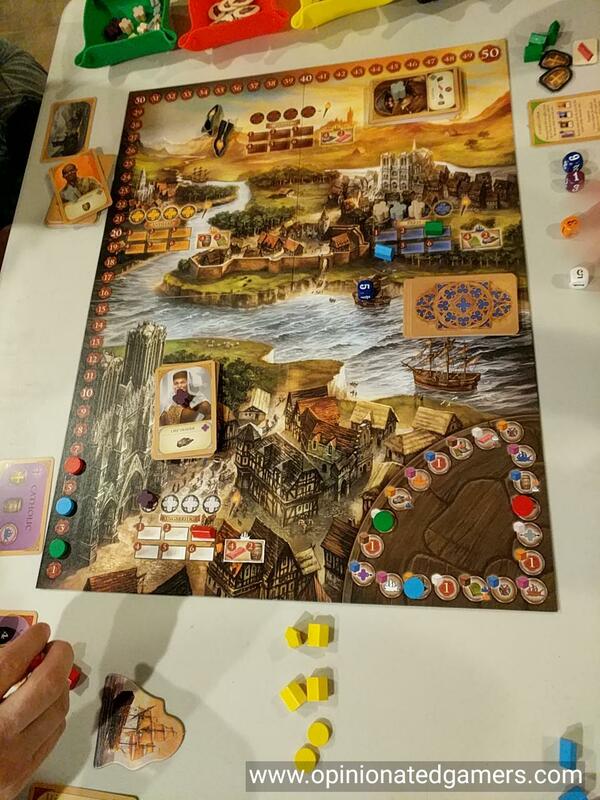 In this third installment, players find themselves in the sixteenth century and they are watching the religious struggles that swept thru Europe at that time. The huge board shows cities in England, France, Spain and Holland with their cathedrals and six influence spaces in each city. There is score track which rides around the left and top edge of the board, and in the bottom right, there is a brown wedge that has the possible special action track. 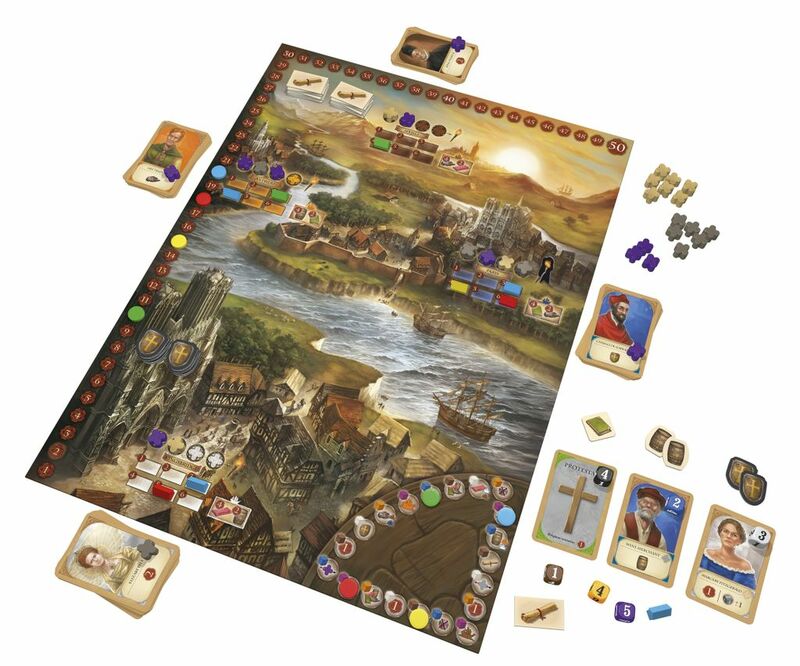 Each player is randomly dealt a Loch Leven card which tells them their initial religious orientation as well as some slightly varied starting resources. Each player also gets a set of six dice: black for their religion; white/brown/blue/yellow for the four cities on the board, and a purple wild die. To start the game, the black die is rolled and placed on the religion card. Each of the cities has its own deck of cards – most of the cards are personalities, each with their own special action, while there are a few events interspersed in each deck. These are each shuffled and placed near their respective city. The top card is flipped over until there is a personality face up. Each personality also has a religious icon on their card (Protestant, Catholic or Neutral) – a matching wood token is placed on that card. Each city has four religious spaces near it, and as the personality card is chosen, the wood token is moved over into one of the religious spaces. The game is played in a number of rounds – until at least one player has 50 or more points. The game will end at the end of that particular round, and the player with the most points wins the game. Each turn is broken up into two halves. Each player will take their first half turn in order, and then each player will take their second half turn. In the first half of the year, players will manage their dice and previously acquired cards. As cards are collected, they are placed to the right of the players religion card. Every card will have a die on it. Going left to right, starting with the religion card, players will decrement the die on a card and then taking the special action listed on the bottom of that card. However, if the die was being turned from a 1 to a “0”, the die is removed, the card is discarded, and the special action IS NOT taken. If it is your religion card, you immediately re-roll the black religion die, and then you whether you want to be Catholic or Protestant, and then place the die back down on the card. In the second half of the year, the active player rolls all of his free dice – that is, all the dice not already on a card. Then, the player chooses a city that matches one of his rolled dice (remembering that the purple die can be used in any city), and then takes the face up personality card next to that city. The religion piece which was on the card is moved into one of the religion slots in that city. (Though, you can discard the religious stone instead if you discard a protection tile). If all four of the slots are filled, a torch marker is placed near the city to show that there will be a religious conflict at the end of this player’s turn. You immediately take the special action listed on the card, and then add the card to the right end of your play area, placing the die used to claim it right on the card. You also take one of your trading houses and place it on the matching numbered spot in that city. If there is an opponent’s piece already in that spot, the opponent’s piece is pushed down into a lower numbered space. If it is pushed off the 1 space, it is returned to that player’s supply. If you already have a house in the city, you can move it to the new number if it is higher. Then, the top card of the deck for that city is flipped over. If it is an event card, the event is immediately resolved. Depending on the event, it can sometimes be mitigated or avoided by discarding a protection tile. You keep flipping cards until a personality card is seen. Only one event card is enacted per turn, so if you draw another one, you simply discard it. Once you flip up a personality card, place the appropriate religion marker on it. Finally, to complete the second half turn, the active player takes an action on the action track. To do so, he must use one of his still unused dice (if he has no dice left at this point, he does not get to take an action). Each player has a marker on this action track, and the markers always move clockwise. Each action is color coded to one of the five non-religion dice, and based on the die you choose to use (the number does not matter), you move your marker to the next available action matching that color on the track and then take the action shown in that space. For the cost of 1VP, you can skip a space and move to the next matching colored space. Now, at the end of the turn, if there is a religious conflict to take place, it is now resolved. You look at the city in question (and the religion marker situation may have changed since the initial alert was created) and see whether there are strictly more Protestant or Catholic markers in that city; if so, that religion with more markers will take control of the city. All players of the losing religion will have their trading houses removed from the city (they were burned down). All players of the victorious religion will score a number of VPs equal to the number of the space where their trading house is in that city. If neither religion has more than the other, the conflict is a wash and all the markers are simply discarded. (Also note that a religious conflict could be triggered in the first half of the year, and if so, it is resolved at the end of that player’s first half turn). If at any point during the round, a player scores more than 50 points, the current round is completed and then the game will end. Otherwise, continue the game with a new first half of the year round. Final Scoring: during the game, VPs are scored from selling goods to the markets, having trading houses in cities that win religious conflicts with your religion in power, taking actions from cards or the action track which grant VPs. Of the three games in the Kingsbridge series, I like this one the most. It may be because this is the only book of the three which I have not read (I grew weary of the series about 70% through A World Without End… It felt like a Book without End), and I came into the game without any pre-conceptions of how it should play or what the story should be like. The shifting nature of your religion choice also keeps things interesting. Watching how the board position changes, and the current status of your opponent’s religion can make conversion a worthwhile event. In a race to 50 points, being on the right side of a religious conflict where you could earn 5 VPs (instead of having your trading house removed from the board) is a big deal! Sometimes, it’s good just to use the powers to cause a city to end up in a stalemate to preserve your trading house. I like to try to have one character at all times that can modify the religious markers somehow. Being able to try to control how and when cities go into conflict is a powerful ability – which can lead to big VP scores for yourself or can really hinder opponent’s strategies with timely removals of their trading houses. As you can only sell goods in a city if you have a trading house there; removing a trading house can really slow down someone’s ability to convert goods into VPs. In my first couple of games, I found the events to be only mildly annoying, and I did not pursue the protection tiles that much. However, as I have played more games, I have found that some of the penalties can be quite tough, and the added bonus of each leftover protection tile as 1VP endgame has made me prefer to have a steady supply of them. While the game ends when someone gets to 50, I have seen a number of games where the player that reaches 50 first is NOT the player to end up winning the game. The 2pt bonus for each trading house and the possibility of good payouts from advantage tiles and protection tiles can definitely affect the final outcome of the game. The board is gorgeous, though 70% of it is really useless space game-wise. You really only need the four blocks of spaces for the cities and the action wheel in the bottom right corner. The rest of the board has gorgeous art on it, and I must say that this is one of those boards that might not feel out of place in a frame on your wall. In my home-made small version of the game, the important parts of the board are on five 4×6 laminated cards. My only quibble with the components is I don’t like the way that purple is used as a wild die color and it is also the color of the catholic religion pieces. One of those two should have been made a different color to prevent confusion. Additionally, in low light, the brown and purple look a lot alike to my eyes – but I realize this is more a personal issue as I have notorious issues with colors in low light settings. 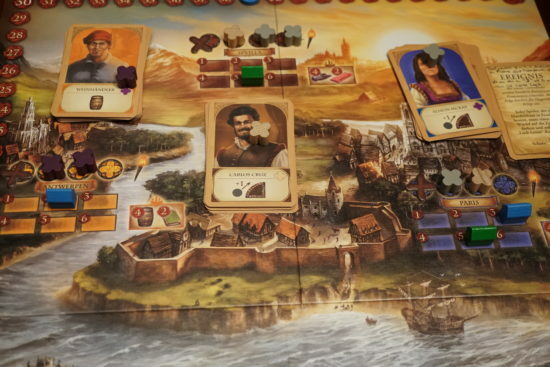 For me, this game packs a lot of decisions in a 60 minute time frame, and given the medium length of the game, each turn feels like it plays an important role in your overall success – thus, you have to make each turn count. Though it has received mixed reviews from some of my local gamers, this one is a definite keeper for me, and as I mentioned earlier, it is my favorite game from this series. Craig M. – This feels like the lightest of the three games in the Ken Follet series. It moves along at a brisk pace which interesting decisions to be made each turn. 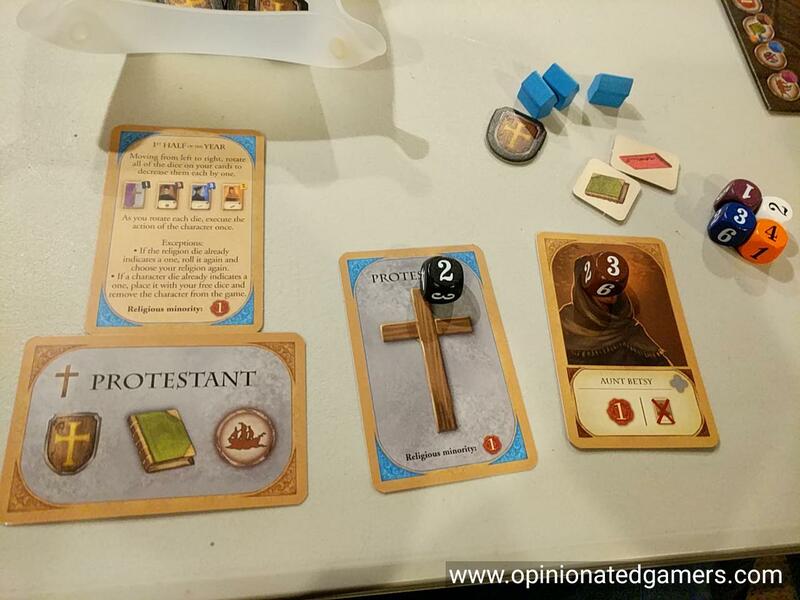 The mechanism for switching religions is clever, but having read the book, it didn’t make the game feel terrible thematic for me. The game has fantastic artwork, but most of the board is really rather unnecessary to the play of the game.